Usually, when I do my morning rounds, I stick to the inner yard and the garage. Every now and then, though, I go farther afield and check on the septic field and the sheds in the outer yard. 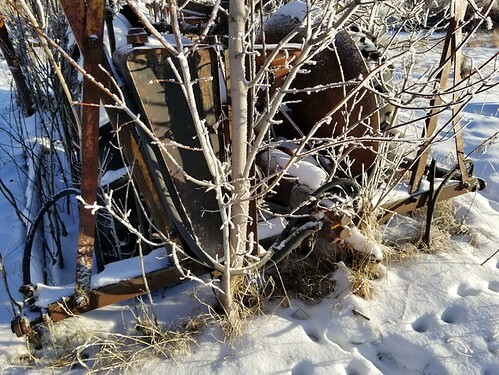 Today was one of those days, and it took me past the old Farm Hand tractor that’s still sitting among the collapsing outbuildings. You know how you walk past things time and again, look at them, but don’t always “see” what’s there, then suddenly something that’s always been there, catches your attention? I had one of those moments today, when I saw this. 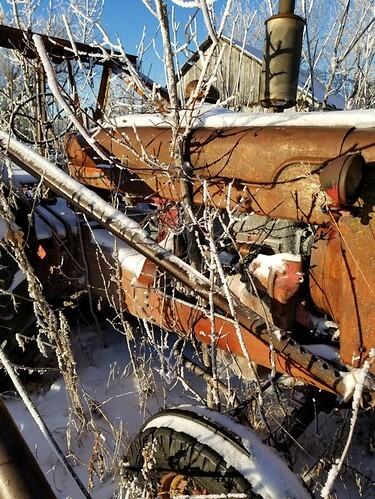 This is the back of the tractor, with a tree grown through the hoses for the hydraulics. With the entire area being overgrown, I didn’t really think much of the burdock and tall grass and weeds. Trees are something else entirely. Like this one, growing through the engine compartment. 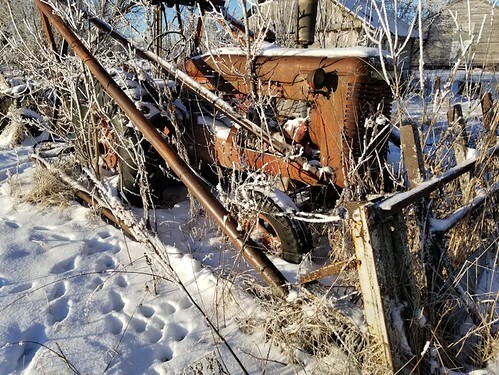 I think, come spring, I will make it a priority to clear the tractor. So far, it doesn’t look like there is actual damage yet – the trees are still small enough – but that won’t last long. This tractor saw so much use, back in the day. It’s been abandoned here for probably at least a decade. We aren’t in a position to fix it up and get it going, but I have family members who would be able to. This thing is pretty much a museum piece, now! It would be a shame to lose it due to neglect.